Our research goals are to support young children’s oral language and writing through play and to build teaching capacity in northern rural communities. Our focus is on children, educators, families and community caregivers in northern rural and Indigenous communities from Alberta in the west through to Ontario in central Canada. An extensive network of partners and collaborators working together to address the need for theoretical, empirical and practical work in the area of young children’s oral language and writing development. Create and evaluate the effectiveness of a professional development model tailored to the needs of educators in northern communities. Ndoo-ndagkenjige dibaamjiganinaanin aawnoon saw ii- aasgaabwitongig binoojiinyag giigidowaad miinwaa dazhbiigewinwaa epiichi damnowaad miinwaa wii-aasgaawitamaang kinoomaadwin giiwednong dazhiikewinan. Nginwaabmaanaanig binoojiinyag, ekinoomaagejig, ngodoodegizjig miinwaa dazhiike naagdawendjigejig oodi sa giiwedinong oodenaanswining miinwaa Shkwanganing oodi Epangishmog nikeying Alberta ezhnikaadeg piish manpii nikeying Ontario ezhnikaadeg naanaawiying Canada. Niibna e-maamwewzijig nyaadmaadjig wiiji-nokiimdiwag wii-wiindmaagewaad nonj nikeying menwezing nokiiwin wi sa nikeying binoojiinh wii-giigidowaad miinwaa wii-maajii-zhibiigewaad. Wii-giizhtong miinwaa wii-aanji-ganawaamjigaadeg ezhi-nokiimgag maanda sa kinoomaagewin ezhtamaagaazwaad ekinoomaagejig oodi sa giiwednong dazhiikewining. EXEMPLARS booklet is here! See how children expand their abilities as they practice letters, with teacher, assistant, and parent encouragement. The NOW Play Publication’s Second Volume of Activities is Here!! Drawn from our NOW Play action research projects with educators who work in northern rural and Indigenous communities, this book offers 19 of their collaborative, creative, curriculum activities (CCCAs). We define CCCAs as learning activities where small groups of children play with materials/objects, as well as with ideas and narratives from various texts, to create written, digital, dramatic, dance, musical, visual arts or other types of products together. In the process, they learn content-area curriculum concepts and solve problems that arise in playing with objects and ideas, and playing alongside one another. CCCAs are authentic learning experiences that build on what children know and can do, and contribute to learning that extends far beyond the curriculum expectations for each grade. NOW Play Publication releases a booklet of exemplars of children’s writing and drawing. Get your FREE copy here! 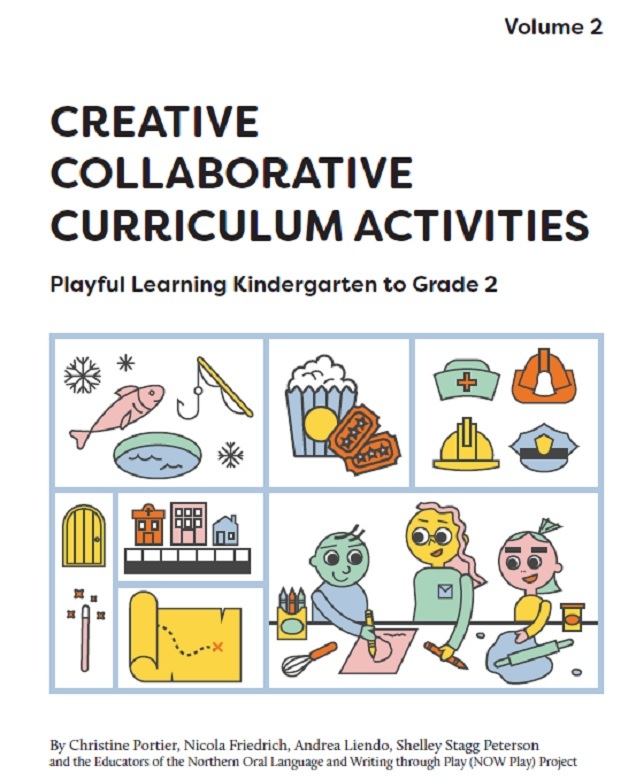 NOW Play Publication releases second volume of Creative Collaborative Curriculum Activities (CCCAs). Click here for a FREE digital copy! NEW publications listed about: play across three continents; children using facework during interactions; and developing a multimodal observation tool with classroom teachers. Christine Portier, Shelley Stagg Peterson, and Nicola Friedrich presented at the SIG Writing annual conference in Antwerp, Brussels at the end of August. They shared initial analysis of the huge data collection of over 150 writing samples from young northern Canadian children.